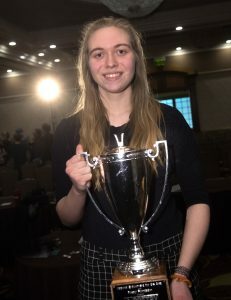 Grace Garver from Petoskey High School, was named the 2018 Michigan Poetry Out Loud State Champion after a day-long recitation competition at the Lansing Crowne Plaza on Friday, March 2, 2018. Ms. Garver took top honors among 39 student competitors, reciting “The New Colossus” by Emma Lazarus in her final round. First runner-up was Jaxon Anderson of Pentwater Public Schools, second runner-up was Avery Fessenden of Leland Public Schools, and third runner-up was India Pruette of Saline High School. As state champion ­­­­­Ms Garver receives a $1200 cash award, $1500 stipend for her school, and an all-expenses-paid trip to Washington, D.C. to represent Michigan at the national competition this April 23-25, 2018. The national competition will be live-streamed at www.poetryoutloud.org. The first runner-up Mr. Anderson will receive $600, with $700 for his school. The second runner-up Ms. Fessenden will receive $200, with $200 for her school. The third runner-up Ms. Pruette will receive $100, with $100 for her school. Student and school prizes at the state level are funded by the National Endowment for the Arts and the Liesel Litzenburger Meijer Fund. All four state finalists will receive plaques commemorating their achievement. The national champion will receive a $20,000 college scholarship. Poetry Out Loud, a national high school recitation competition, encourages youth to learn about great poetry through memorization and performance, while also mastering public speaking skills, building self-confidence and learning about literary heritage. The program has engaged more than 78,000 students since the Michigan Humanities and Michigan Council for Arts & Cultural Affairs began hosting it in 2005.